Not all warriors need or want something showy and flashy when it comes to their armor and their protection. Sometimes, raw steel is all that is wanted. If that is the case, this 14th Century Gothic Gorget blends fine lines with equally fine protection. This impressive neck protector is modeled after a similar piece found in the Wallace Collection, a gathering of historical artifacts including arms and armor, located in London, England. This particular gorget is a stunning recreation with a swiveling plate for variable protection. Made of solid 14 gauge steel, the layered plating around the collar, neck, and jaw ensure that a warrior will not soon lose their head to anything but the strongest of blows. 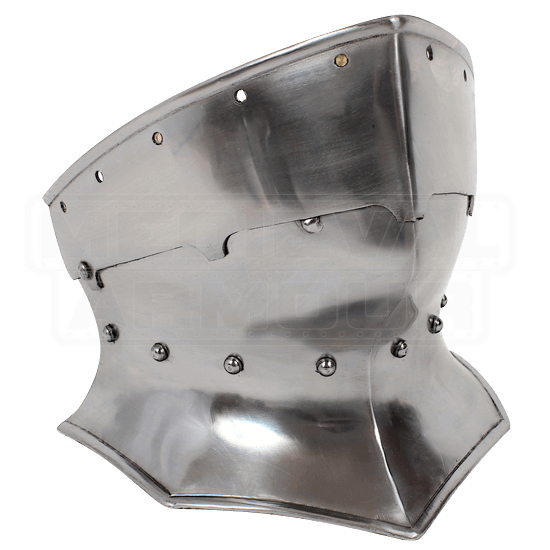 Curved edges and rivets provide reinforcement, as well as a small influence of gothic design that was prevalent in much 14th, 15th, and 16th century armour. The gorget is worn independently, using a series of leather straps and buckles that secure it around the neck. Any warrior who plans on surviving the frenetic chaos of battle should maintain quick, calm thinking and wear this 14th Century Gothic Gorget, as both will serve to help a warrior keep their head about them in even the most hectic of battle scenarios.